"As far north as Brunei and as far south as Pontianak in Kalimantan, the effect was that people learned to run away on merely seeing these Iban...otherwise the result would surely be decapitation. Even children all along the coast expressed great fear when the name of the Skrang Iban was heard. Embroideries were made on the headhunters' reputations, and such customs as hauling people with hooks attached to poles and then cutting their throats were attributed to them." In traditional Iban belief, headhunting served to maintain the ritual prosperity of the longhouse by ensuring agricultural and community fertility. In an Iban allegory, trophy heads are described as containers of seed, which have the object of enhancing the fertility of the hill rice, the Iban's staple food. "This 'seed' [head], explains Shaman Guyak, says it is angry and crying, as it wants to be planted like young banana plants. This 'seed', explains Shaman Lambong, wants to be harvested as are the yams that are planted deep in the soil." Although severed heads were construed as phallic in nature, it was the flowing blood that represented the life-giving symbol. In the eyes of the Iban gods and deified ancestors, the taking of fresh heads was not only pleasing; it was also rewarded with many gifts. In response to headhunting, for example, the divine indicated locations in the forest where rice fields should be cleared and planted; they protected the rice fields against crop failure; they lent their diagnosis in times of illness; and they accompanied men in war or on the headhunt to insure success. For the Skrang Iban, headhunting was an institution believed to maintain balance and harmony in the cosmos. And oftentimes a man's status was not established until he had proven success in headhunting itself. Such proof not only came in the form of a severed head that would hang from the rafters of the longhouse, but later from the completed tattoos (pantang) that were lasting symbols of his participation in the human hunt. 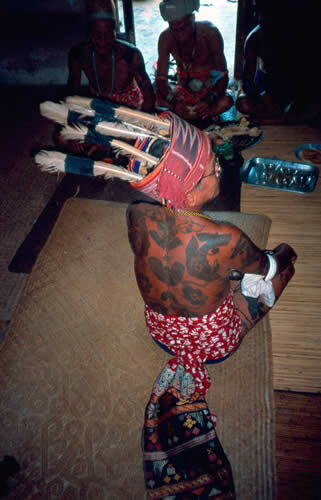 But just as a great warrior was tattooed to mark his achievements in headhunting, Iban women were tattooed as proof of their accomplishments in weaving. Although many Skrang Iban women were accomplished weavers, gaining prestige and enhanced status through their labor-intensive work, only a few were truly experts, able to produce the sacred pua kumbu' blanket that contained the most powerful and intricate designs and colors. Woven by a master some 100 years ago, this pua from the Skrang River is considered to have a life of its own. Although water-damaged from numerous floods, the design motifs are bold in their abstraction and show a headhunting scene: spirit figures holding skulls (near bottom), crocodiles, water serpents (side), and centipedes (bottom) dominate the patterning. Each figure was believed to repel evil spirits and sometimes they appear as tattoo designs on both men and women. 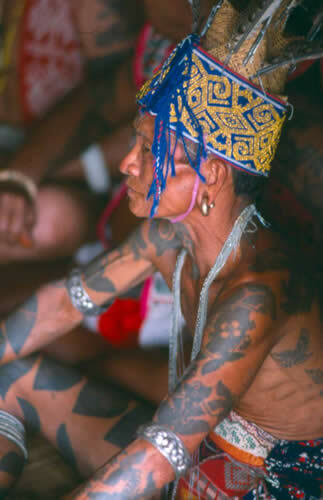 Skrang Iban man with heavily tattooed back and woven headband made of traditional hand-dyed cotton fabric. 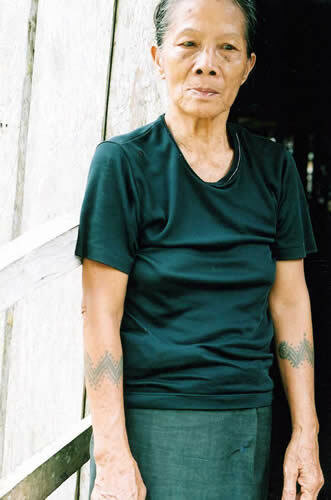 75-year-old woman of the Skrang River with enkadu (caterpillar) tattoos. These designs are simply beauty marks, inked on her arms by her boyfriend around 1945. Weaving pua blankets was a hazardous spiritual undertaking, and was considered as important as the headhunting rites practiced by warriors. The Iban called it "women's war" (kayau indu'), because dyeing the cotton yarn in the blood-red color was dangerous, since this natural red dye - like blood - attracted spirits that might bring trouble or death to the weaver, the weaver's family or even the entire longhouse itself. Typically speaking, only one in 50 women even knew how to make the crimson liquid or "knew the secret of measuring out the drugs in order to obtain the rich color" (Orang tau nakar tau ngar). It was precisely these women who were allowed to be given special tattoos, ones that worked as kinds of protective devices. 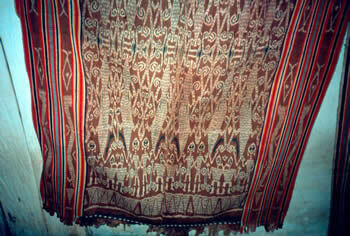 As noted, the most important of Iban fabrics was the sacred blanket called pua kumbu'. 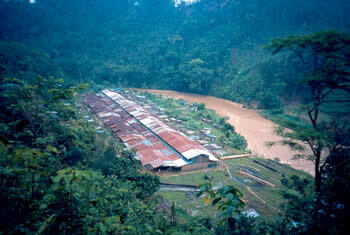 Puas had several uses, the most significant being to receive freshly severed human heads captured by Iban warrior men. 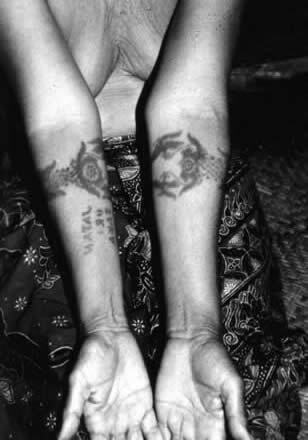 Iban shamans (manang) used puas too. They created sacred enclosures with them, sitting under their puas in anticipation of the arrival of their spirit-helpers (petara). Petara were summoned before wars, headhunts and healing ceremonies. The entire process of creating a pua required great mastery and patience, not to mention ritual knowledge and actions, including the sacrifice of a pig or chicken whose blood appeased the spirits. Each woven design was vested with its own meaning and spiritual energy, and weavers were compelled to follow a type of ritual etiquette when conducting their work at the loom to avoid personal or collective disaster. For example, if a weaver overstepped her weaving competency, she risked invoking the wrath of spirits who could render her layu or "wilted." If a weaver created a pua with anthropomorphic spirit figures (engkaramba) in the central panel, these had to be carefully "fenced-in" with centipede (kemebai) bands and strong top, bottom, and side designs. Otherwise, the spirits might break loose from the cloth and cause disharmony and misfortune in the longhouse. Like Iban tattoo artists (who were men), weavers employed the use of many protective charms in their work, usually small sacred stones, porcupine quills or even meteorites. 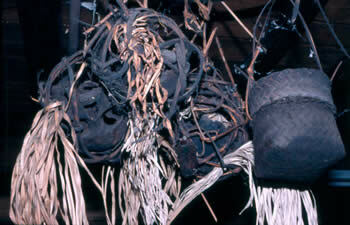 Generally speaking, the locations of these objects were revealed to the weaver by ancestors in their dreams. 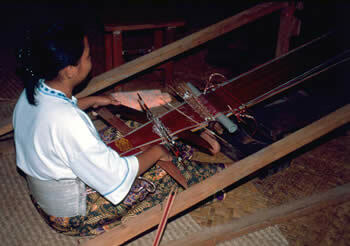 Weavers also fortified themselves against evil spirits by biting on pieces of steel to strengthen their souls. Furthermore, they communicated with spirit helpers (antu nulong) in their dreams to prevent irritating other spirits that were to be represented in a new textile and to advance their "psychic strength", especially if the pua was related to headhunting. Such supernatural communications also protected weavers from those spirits attracted to the blood-red dyes used in their pua creations which were nearly equivalent to human blood. Obviously, pua weaving was a hazardous physical and spiritual undertaking. And for this reason it was considered complimentary to men's headhunting practice. Expert weavers not only participated metaphorically in "war," they also gained prestige and enhanced status for their spiritually charged textile works, not to mention the attention from bachelors living in the longhouse community! Expert weavers who participated in "women's war" were both socially and ritually marked, like headhunters, with small marks on the fingers or other tattoos that covered the thumbs. However, master weavers, or those who possessed the highest powers, were afforded another form of tattoo; one which specifically conveyed spiritual protection to its owner - the pala tumpa' or "head of bracelets" tattoo. 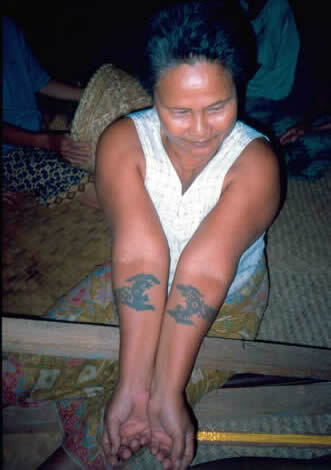 Although extremely rare today, pala tumpa' is both a tattoo and sometimes an heirloom passed from mother to daughter. The tattoo takes its name from the position on the body where it is placed, usually on the forearm, where successive rows of traditional bracelets were worn. Of the few that I could locate in Iban country, the scorpion (kala) and centipede (kemebai) motifs seemed to dominate each pala tumpa' design. I was told that each creature is believed to be a protective symbol, as they are among other indigenous peoples living in Indonesia, Papua New Guinea, the Philippines and Polynesia. However, with changing lifestyles and values, the most powerful puas and tattoos associated with weaving have become obsolete. Contemporary weavers are converting to commercial ready-dyed yarns and tourist motifs, and pala tumpa' tattoos are now only worn on the arms of a few elderly experts. Sadly, 'women's war' and the tattoos associated with it are being invaded by changing times. And within the next generation, perhaps both spiritual art forms will disappear forever.